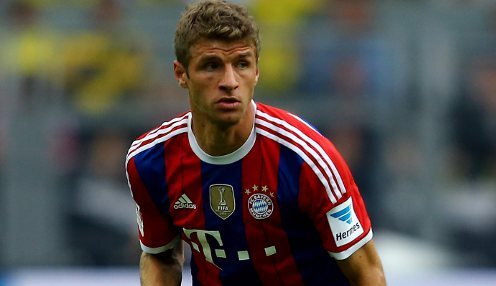 Bayern are confident Thomas Muller is not leaving the club. Vidal, 28, has agreed terms with Bayern and will have a medical this weekend after helping Juventus secure four successive Serie A titles during his time in Turin. There has been a lot of speculation over the future of 25-year-old Muller, with reports suggesting he could be set to join former teammate Bastian Schweinsteiger at Manchester United. However, the Bundesliga champions have reaffirmed that Muller will be staying at the Allianz Arena next season. We would be out of our minds to sell Muller. Bayern chairman Karl-Heinz Rummenigge confirmed they have received offers for Muller but he says they are in no mood to sell. "There are some players who don't have any price tag. We would be out of our minds to sell Muller," he said. European success has so far eluded boss Pep Guardiola in his two seasons in German football. Bayern are 1/1 to win the Champions League next season and, according to Rummenigge there is no reason to believe it will be the Spaniards final season at the helm despite his current contract expiring next summer. Speaking from the clubs pre-season tour of China, he said a new deal could be agreed in simple fashion when the time is right. Rummenigge added: "I can't currently think of any reason why Pep would leave us. Maybe we'll just meet for an espresso and clear everything. "But if Pep doesn't want to stay, our world would not fall apart." Bayern are 1/1 to defeat to Wolfsburg in the German Super Cup on Friday 31st July, with Guardiola's team 1/1 to win the game 2-0.